Our members always remark that our congregation is like a family. We get together at least once a month for a time of fellowship, sharing in a meal and an activity. Check our Events page for upcoming fellowship events. One of our children learns the rules of dominoes. On the last Friday of the month, we meet at 6:30 pm for game night. We bring snacks to share and our favorite table top games. 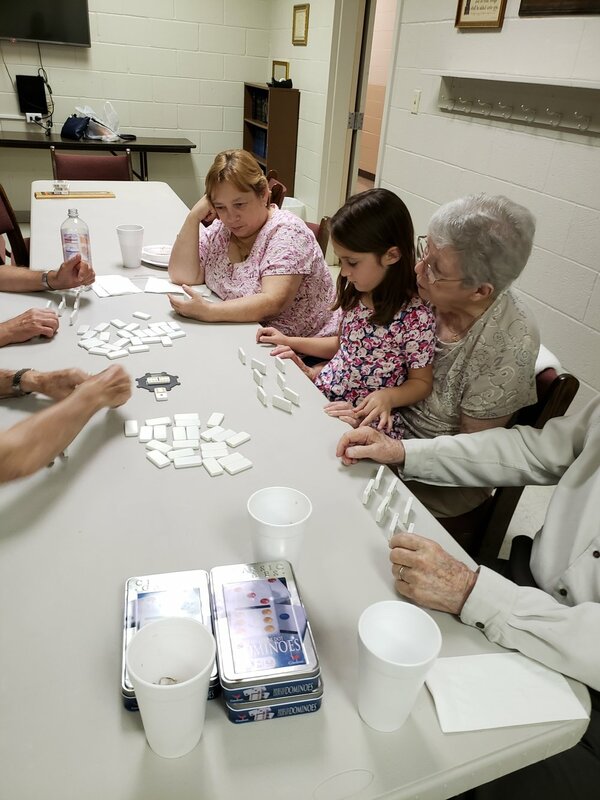 Many of our members prefer social games like dominoes, bridge, or Tezni, but we also have dedicated board gamers who like Ticket to Ride, Acquire, and Pandemic. You don’t have to bring a game or be familiar with games in order to participate. And you don’t even have to play! Just come and eat and chat. A nursery is available. 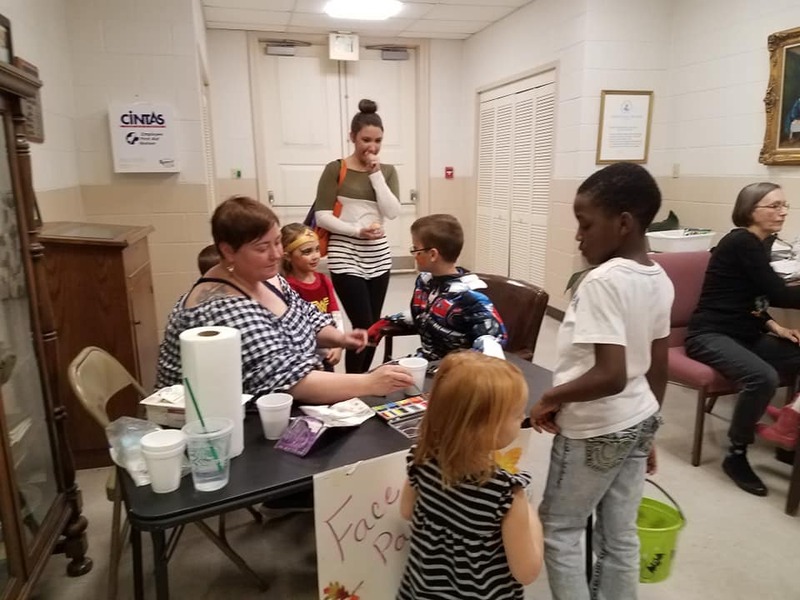 Each year, we host a Fall Festival on the Sunday before Halloween. Give your children a safe place to trunk-or-treat, bounce in our bounce house, play carnival games, get their faces painted, win prizes at our treat walk, make Halloween and fall crafts, and get plenty of candy! All activities are free. We also sell hot dogs and hamburgers and other food items for your dinner. Check out our pictures from this year. Enjoying a Thanksgiving meal together. 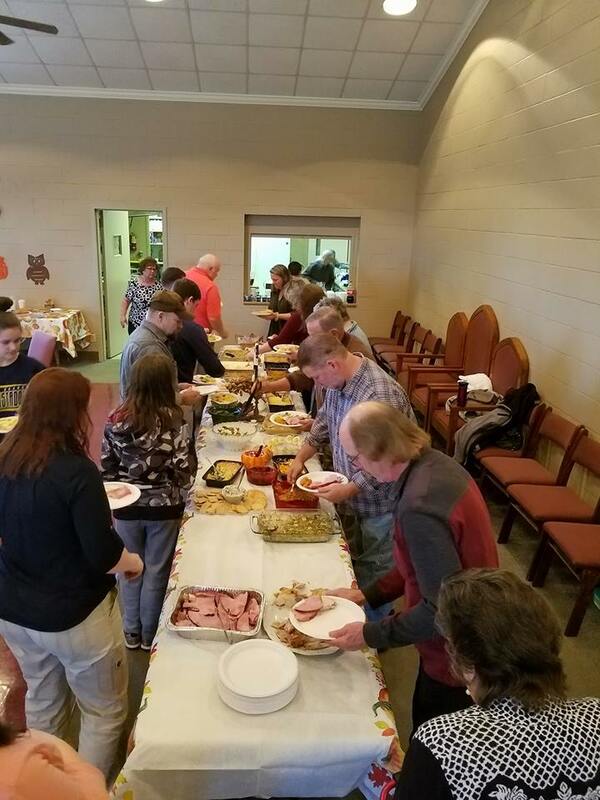 Our close-knit congregation enjoys sharing holidays together. On Thanksgiving we have a noon meal where everyone brings their favorite Thanksgiving fare and our families all eat together. Men of Grace patiently waiting the Thanksgiving Meal! During Advent, families in the church sign up to participate in our Magi Family program, which is sort of like Secret Santa. Each family gets another family to pray for. Some families like to keep their identities a secret and give a few small items throughout the Advent season, then reveal who they are during the week before Christmas or on Christmas Eve. On the second Sunday of December, we host Breakfast with Santa, with a delicious, home-cooked breakfast and a visit with the jolly old elf himself! Kids can have their pictures taken with Santa, play games, and make crafts. Everyone is invited to share in the meal. Check out our pictures from this year!